A fleet of robotic submarines, based at the National Oceanography Centre (NOC), head-quartered in Southampton, have been used to map vulnerable cold-water coral reefs in the deep ocean off southwest England. This data set is being used to inform the management of a new Marine Conservation Zone (MCZ) that protects the only area of deep-sea coral habitat in English waters. This MCZ forms part of a national network that is being expanded this week as a second round of designated sites are announced by Defra. Scientists at the NOC worked in partnership with the Defra network to collect data from The Canyons MCZ, which is over 300 km southwest of Cornwall, using an unprecedented variety of marine robotic vehicles deployed from the research ship, RRS James Cook. Collected data include 3D maps of the seafloor and high-quality video and photos, and show the location and extent of the corals. This data set is providing Defra with robust evidence that will guide decisions about how to implement management measures at the site. The Canyons MCZ is particularly challenging to survey as much of the site occurs within a deep-sea canyon over a mile deep. By using the research ship and robotic vehicles together, the NOC team were able to create a series of detailed maps of the site at different scales from tens of kilometres down to a few millimetres. Ship-based seafloor mapping provided information on the overall shape of the canyon, and the Autosub6000 Autonomous Underwater Vehicle was then ‘flown’ within the canyon to make more detailed maps of coral habitats. While Autosub6000 was undertaking its missions, the NOC’s Remotely Operated Vehicle, Isis, was deployed to map steep canyon walls and collect images and samples that confirmed coral presence and species. By using these robotic vehicles in combination, the team were able to collect a vast array of high-quality data in just three days, demonstrating how robotic vehicles can augment relatively expensive ship operations. 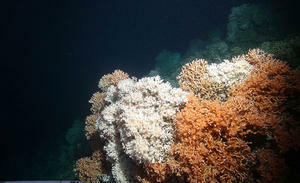 In addition, by directly deploying the vehicles into the depths of the canyon, the team were able to map and image steep and overhanging rock walls that hosted extensive coral communities; these habitats were previously overlooked using conventional (downward-looking) ship-based instruments.